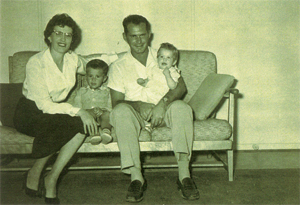 Then, on November 11, 1955, we left Arabia again to go on our scheduled home leave after two more years with Aramco. We flew to Amsterdam, Holland, spent one night there, and then flew on to New York City. We spent another night there, then flew to Dallas, Texas, the next day and checked into the Adolphis Hotel. Coincidentally, we ran into a couple from home, Dot Sala & her husband, who lived in Dallas then. Small world! The next day, Oran bought an aqua & white, new Oldsmobile, which we drove to my parents' home in Turnertown in East Texas. It was good to be home again, too. We did spend a few days there while we looked for a place to rent, get over our jet lag, and see other family and friends. We had brought home a German Coo-Coo clock Keith had pulled off the wall in a friends home that broke into what seemed like a million pieces. We bought it, and were going to try to have it fixed by an old college buddy of mine who worked in a local store, but, alas, it was too far gone. After a short period of time, we did find a fully furnished house to rent on the northeast edge of Henderson. We couldn’t believe our luck. It was in a wooded area with a small lake, including a small fishing boat, but just about a mile from a business area of the town itself. Not only that, there were lots of trees, and they still had their leaves with bright fall colors. It was perfect for us and we loved it. We got settled in, bought groceries and other necessities and started really enjoying our vacation (home leave). Each morning, Oran got up and went out on the lake fishing until I got breakfast ready. I conveyed this to him by yelling out the kitchen window, and then he rowed back in to eat. The kids loved it, too, and got their share of boat time and did some fishing, as well. They also loved walking in the wooded area and across the small dam at one end of the lake with their grandparents and us. They visited us often, as it was just about 10 miles from their house. They still had us to their house for some meals and I cooked for them, as I had hoped to. Some of Oran’s sisters, brothers and families were able to come round, too. So it was the first time, since our wedding, we really felt like we had a home in the States. It was a good feeling. We did have Thanksgiving with my folks, and then started doing some shopping. We would be sending a trunk shipment back as well as a footlocker to Arabia, as well as buying new clothes for all of us, and this time - Christmas presents. That would be at my parents home, too, with other family members. My sister Jolene & husband, Bill, with children, Johonna & Paul; my brother Ben & wife, Frances, with son, Paul; Aunt Abbie and Uncle Verl Davison and Aunt Jo Hayes from Tulsa, Oklahoma would be there. My sister & brother, Jerri Sue & Bill were still young, 13 & 11, so lived at home. We were glad our children would be exposed to all this family. There were the usual decorations, with a real, live, cut in the woods, Christmas tree, much more than we ever had in Arabia. I helped Mother hang cards around the door and on the Venetian blind slots at the window, a tradition I still carry on today. A nativity set was on top of the television set with angels floating on cotton clouds over that, cleverly held by strings from the ceiling. We didn’t have to worry about restrictions then, as we were in the United States. Christmas Eve we all gathered in the living room around the tree to open presents after the homemade, traditional eggnog. It was always crowded and hectic, but my favorite part. There were serious gifts, but the fun ones, too. My father received a harmonica so he immediately played it, or tried, and danced to the rhythm. He also received a homemade barbecue apron, with a special area to wipe your hands, which was the envy of everyone. Fireworks topped off the evening to everyone’s delight. We were in the country, so there were no restrictions there, either. The next day, after seeing what Santa had brought, the women returned to the kitchen to work their culinary magic under the direction of my mother, and another outstanding Christmas dinner was produced. I had missed my mother’s home cooking. After the naps and our family card game of pitch, we went back to our little “home” in the woods. It had been a wonderful Christmas. We had received picture Christmas cards from three friends and their families in Arabia. 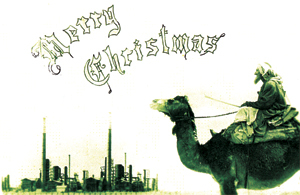 The Smyth’s card showed an Arab on a camel in front of the Refinery with Merry Christmas across the top, the four of them, Pat, Steve, and Guy holding Valerie, sitting on the couch and the message: "Wish we could join you for the Holidays. Have fun!" They had just gotten a letter from us. Lynn & Ken Cobb’s card showed the same Arab on a camel in front of the Refinery, and a picture of the two of them sitting on chairs in front of their window drapes, holding hands. Lynn had on a pretty, white maternity outfit. The cover of the Tyler's Christmas card. 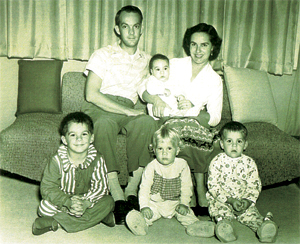 The third card was from Nona & Lou Tyler, their children Ross, Bruce, Gail, and Wayne on their couch in front of drapes. The Christmas picture was different. It said: “A Dry Desert Christmas. 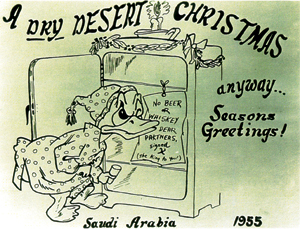 Anyway, Seasons Greetings, Saudi Arabia, 1955.” It showed a decorated, open refrigerator with an animated Donald Duck in nightshirt and cap looking at a note inside which said, “No Beer or Whiskey, Dear Partners, Signed X (the King to you)”. It was clever and cute. The last day of the year, 1955, was spent quietly, contemplating what the next year would bring. There were no big parties, singing and dancing in the streets (ha), just a Happy New Year kiss before bedtime. During the month of January 1956, we continued to enjoy our house and lake in the woods, as well as our families. We also seriously shopped for our shipment items for our trunk and footlocker. That was always a chore and time consuming, but we all pitched in and soon had what we wanted. We had done all the paperwork, made the inventory lists and sent them on their way. We would look forward to receiving them in Arabia, and be glad we went to the trouble. It was just part of our life there. We received another letter from Lynn & Ken that announced the birth of their son, Michael. So, we would have something else new to look forward to when we got back to Arabia. It was soon time to head back that way, so we gave up our house in the woods, packed, and moved back in with my parents the last night of January. We had to make a decision about our car, so my father purchased it from us at a good price. My parents were driving us to Dallas to catch a morning flight to New York, so we got up in the wee hours and started out. It was still dark, so the kids were sleeping in the back seat with my mother, and my father, Oran and I were up front. Things were going fine until we had gone about eight miles west of Tyler. Then I saw a big mule crossing the highway in front of us and yelled out, “mule”. Oran had seen it about the same time, so slammed on the brakes hard, but didn’t get the car stopped before we hit it. The bumper must have caught him low on the legs, though, because he flipped right over the car, but a hoof broke the windshield. There was a round hole on the far left side, and of course, the car was out of commission. We were all in shock, but soon learned that, miraculously, no one was hurt, not a scratch. A car stopped immediately to help us, so we asked him to call the police and Oran’s sister in Tyler as soon as he reached Canton. It was a very dark, wooded area, and several lights did come on in small frame houses along the mostly deserted highway, but no one ever came out. The police arrived before we knew it, and were very pleasant. They checked on us and then looked for the mule, all up & down the highway, but, surprisingly, never found it. Oran’s two nephews, Freddy and Jimmy, arrived about that time in separate cars, so since everybody was okay it was decided that one nephew would drive us to the airport and the other would drive my parents back home. My father wasn’t too happy, but Oran assured him he would make everything right pertaining to the car, and he did. What a way to say good-bye to your parents when you were going back to Saudi Arabia for two more years. But we did and took off for Dallas. Jimmy drove so fast I thought we’d never make it alive, but there was little traffic, and when we walked in the door at the Dallas terminal on Lemon Avenue, they were making the first call to board. We told them what had happened, so they held the plane and gave us all four seats up front that face each other because there was almost no one aboard. That turned out to be an excellent trip. We fed the kids, then put them in a double seat apiece to sleep, which they did almost all the way there. Then Oran & I leisurely ate our breakfast and relaxed. It was really nice. A few hours later, we checked into the Park Sheraton Hotel in New York City and ran into Peggy & Jerry Nored, who were taking the same plane back to Arabia. Their daughter babysat Keith & Vicky while we went out to supper (that’s all, we wanted to get a good night’s rest). Once, while we were there, I caught Vicky with the telephone receiver to her ear, saying, “Hello, Myrt”. It was really cute.